Our retractable security grilles are designed so as the security grille fits directly on its sides. This eliminates the need of side tracks which makes it more bulky and bigger stacks when opened. 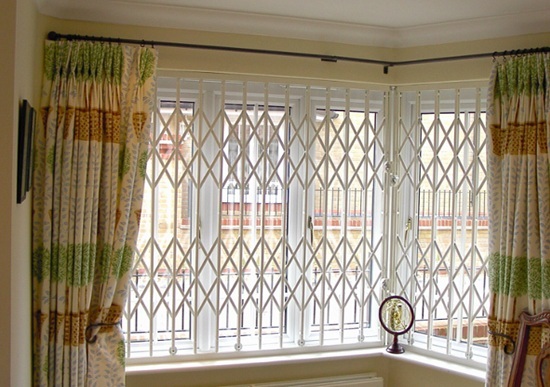 The stacks of the grille are kept at its minimum, which can be easily hidden behind blinds or curtains. Flat steel plates are vulnerable to saws. Our lattice are manufactured in a “w” shaped design to make them more sawing resistant. – Internal Wheel Integration: The wheel are designed and integrated to operate internally. This makes it more difficult for them to get damage to daily usage and pull friendly especially when the collapsible grilles are not being pulled from a centre position. Both our bottom and top tracks are fixed independently. This enures easy fitting and a beneficial gain in the amount of installation time. On average, rsg grilles can be fitted in half the time compared to other sliding grilles on the market. A unique security fixing is implemented in each corner to enhance security at the vulnerable spots. An anti-jemmy bar is integrated on the outer face of our concertina grilles to protect the locks from attack. Crowbars are widely used in most break ins. The anti jemmy strip defends the security grille from this type of attack. For more information on our security grilles, please call us on 0208 123 1088 or get in touch through other means via our contact page.